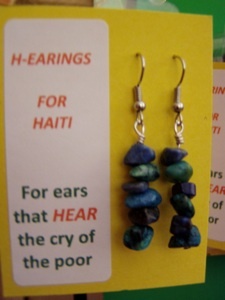 •H-earings is a grass roots effort to raise awareness of the great need of people struggling to exist in the deeply rooted poverty of Haiti, and to let people know about the wonderful work being done to empower Haitians to build a better life. 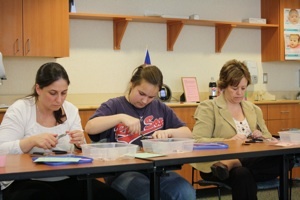 We hope that through the selling of our earrings we will make a significant impact over time to assist with this effort. •To raise awareness for the poor - to awaken "ears to HEAR"
We also support the Missionaries of Charity homes for Children and for the Dying in Haiti- no website available. 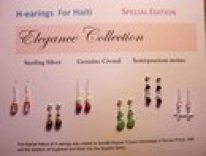 •Wonderful hand-crafted earrings made by...YOU, the volunteers who come to our H-earings Parties. Each pair is unique and made with a heart of compassion for the poor. 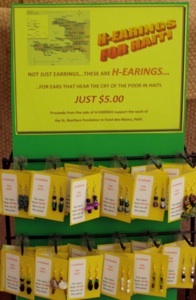 •H-earings are available at St. Mary’s Hospital Gift Shop and the Joyful Hope Gift Shop in the Auburn Mall.